Oh Italy…why do you shame yourselves? | Help! I live with my Italian mother in law! Oh Italy…why do you shame yourselves? Let me be very clear about this post. I love Italy for all her quirks and the longer I am here the more i have learned to take the difficulties here in stride (the good wine helps). But seriously, let me be extremely unapologetic and blunt about this rant because things like this cut me to the core. Up to a week ago there used to be a garbage bin in this space. No recycling, just garbage. We are still very much behind the times here when it comes to recycling, but that is for another day and another post. There is another bin further down the road, so it’s not like we have nowhere to put our trash…My questions is this: why would anyone think it is totally okay to just throw their trash bags on the street where the bin used to be? Seriously! This is utterly a shameful act. You will walk ten blocks to your favourite bakery for the best bread in town but won’t walk half a block to keep your street, city, country clean. Shame on you. 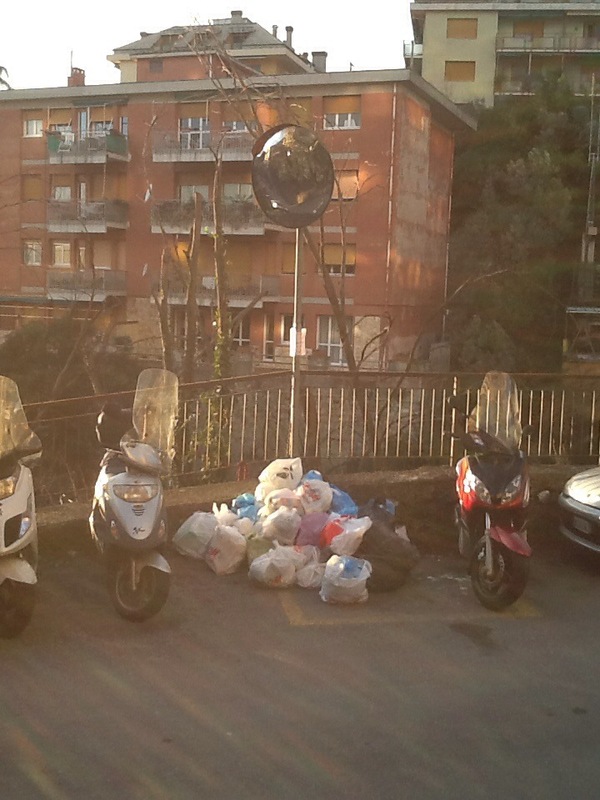 This entry was posted in Italian Culture and tagged garbage on fhe street, shameful. Bookmark the permalink. 11 Responses to Oh Italy…why do you shame yourselves? Its the same in Boston. We spend hours cleaing up a public lot near our condo only to have neighbors drop trash bags and appliance boxes in the lot, being to lazy to breakdown the boxes or buy a city mandated trash bag. Bah! It really saddens me to hear this about Boston too. Such a nice city. I have never seen anything like this in Canada. The worst I saw was when they went on strike and Toronto had bins overflowing on the streets on a hot summer day. But maybe this situation is bad everywhere and I have been out of Canada for too many years to have noticed? Amy, I have no idea. I haven’t seen any notifications about it at all! It just disappeared one day and nothing has replaced it. But it is still no excuse to just leave bags on the road where animals can get into them. And also when there is another bin just down the street and around the corner. Oh my gosh! This stuff makes me crazy too. And when they throw their tissues or cigarettes out of the car window onto the street? It really saddens me. And the weird thing is…their homes are SPOTLESS!!!! I guess they are just lacking a sense of community. It’s definitely all about lack of community. I see rubbish dumped like this all the time in Rome, it’s the same with the dog poo everywhere. I’ve started to become used to it and was amazed when I went back to UK at Christmas not to see any rubbish or poo on the pavements! Gah! It’s a universal issue. Awful! Yes Wendy, it is sad. When I was recently in Cozumel, Mexico I was appalled at how littered some of the beaches were too. But in a big cosmopolitan city I would expect better.